ESPEI, or Extensible Self-optimizing Phase Equilibria Infrastructure, is a tool for automated thermodynamic database development within the CALPHAD method. It uses pycalphad for calculating Gibbs free energies of thermodynamic models. The implementation for ESPEI involves first fitting single-phase data by calculating parameters in thermodynamic models that are linearly described by the single-phase input data. Then Markov Chain Monte Carlo (MCMC) is used to optimize the candidate models from the single-phase fitting to multi-phase zero-phase fraction data. The benefit of this approach is the automated, simultaneous fitting for many parameters that yields uncertainty quantification, as shown in Otis and Liu High-Throughput Thermodynamic Modeling and Uncertainty Quantification for ICME. Jom 69, (2017). Single-phase and multi-phase fitting methods are described in Chapter 3 of Richard Otis’s thesis. The ESPEI package is based on a fork of pycalphad-fitting. The name and idea of ESPEI are originally based off of Shang, Wang, and Liu, ESPEI: Extensible, Self-optimizing Phase Equilibrium Infrastructure for Magnesium Alloys Magnes. Technol. 2010 617-622 (2010). 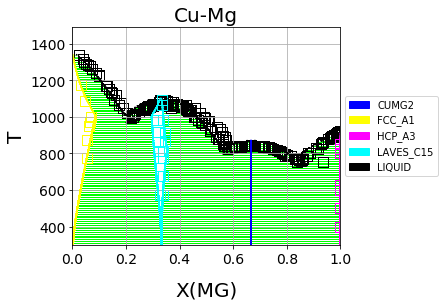 B. Bocklund, R. Otis, A. Egorov, A. Obaied, I. Roslyakova, Z.-K. Liu, ESPEI for efficient thermodynamic database development, modification, and uncertainty quantification: application to Cu-Mg, (2019). http://arxiv.org/abs/1902.01269.